Heat the oil in a large frying pan. Brown the meat in batches for approx. 2 mins. per batch, remove from the pan, season with salt. Briefly sauté the onion and garlic in the same pan. Return the meat to the pan, pour in the wine, reduce a little. Add the tomatoes, tomato puree and breadcrumbs, mix and season. Mix in the basil. Stuff the peppers with the meat mixture and place in the prepared dish. Heat the butter in a frying pan, mix in the breadcrumbs. Spread the crumb topping over the meat filling. Pour the stock into the dish. Approx. 30 mins. in an oven preheated to 200°C. Remove from the oven, garnish with basil. Accompany with boiled rice and a seasonal salad. 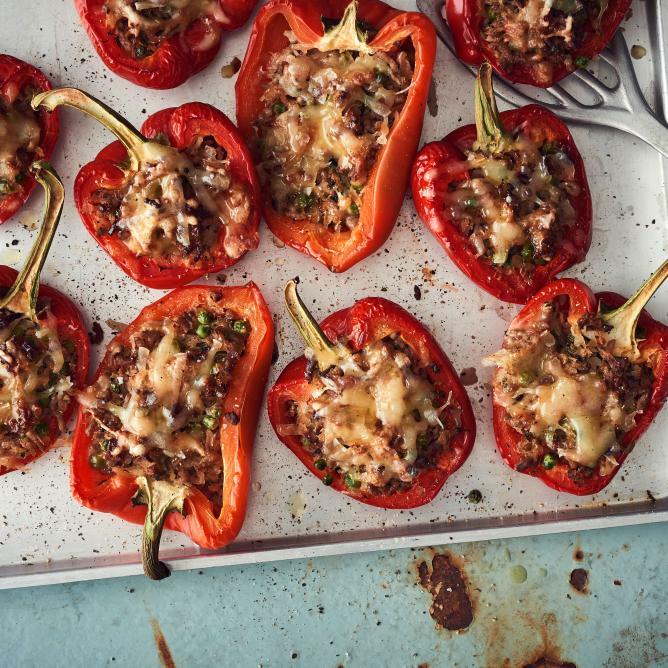 Replace the peppers with courgettes. Scoop out the inside of the courgettes, finely dice the flesh and mix in with the mince. Instead of basil, use other herbs such as oregano, thyme or parsley. Homemade breadcrumbs: Finely grate old, dry gluten-free bread rolls (e.g. Schär Panini) using a grater or place them in a bag and crush them with a rolling pin.